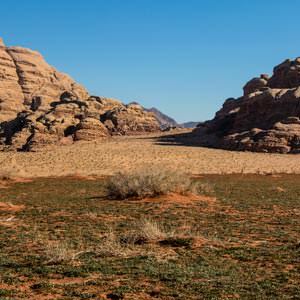 What is springtime like in Wadi Rum desert? 12 Feb What is springtime like in Wadi Rum desert? Springtime, the most beautiful season of all. The season of life, renewal, rebirth, rejuvenation, resurrection and regrowth. It is the favourite season of many people all around the world. And here in Wadi Rum, it is no different. We also love the spring season. When spring starts depends on which method you use to calculate: meteorological, astronomical, solar, ecological, calendar-based or natural events. We favour the natural events to determine the start of the seasons. 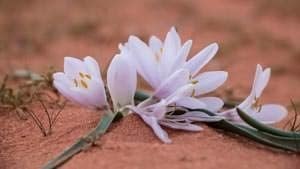 Today we share some information and pictures about spring in Wadi Rum desert. The first thing we notice about spring arriving is that the short days start to lengthen. The sun starts to shine more hours. And it also gets higher in the sky every day. And the rays of the light hit us more directly as well. Making the sunlight more intense and warm. Because of all this, temperatures start to rise. We leave the cold and dark winter behind us and enjoy the lighter and warmer spring. In autumn and winter, we had quite a bit of rain. And since a couple of weeks, the soil begins to warm again because of the increasing and stronger daylight. Two of the main ingredients to start the process of growth of plants. Which is very visible in our desert right now. Otherwise barren plains and valleys turn green. All kind of smaller annual plants pop up everywhere creating a big green blanket on the valley floors. And many desert plants that seemed to be dead come alive again. They start to grow and turn green once again. Like many herbs and medicinal plants also do. Don’t forget to smell their lovely and intense aromas. And watch the beautiful and stunning small and big plants. They start to bloom in many different colours. Some of them will cover the valley floors with carpets of violet and yellow flowers. Goat and sheep give birth only once a year. 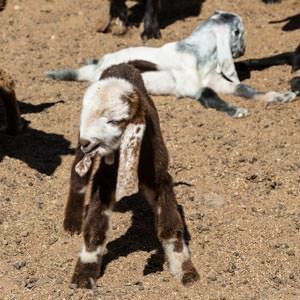 The gestation time for both sheep and goats is about five months. Traditionally many baby goat and sheep are born in spring. Most goats and sheep bring 1 or 2 young at a time. Some can bring up to 4 new-borns. Our camels mostly give birth once in 2 years. Their gestation time is between 12 and 14 months. Most of them are born in early spring as well. So as you will understand right now, you can see many new-borns in our desert. Many camels roam around the valleys closer to the village in spring. So do the herds of sheep and goat. Altogether you have a fair chance of seeing all these animals and their newborns during a desert tour in springtime. As many herds are grazing in the valleys nearby Rum village. Just like last year we again offer our spring tour. Are you coming to Wadi Rum this month or next month? Do you wish to experience springtime? Book this special tour now. Of course, we visit famous sites like Lawrence spring, Khazali canyon and Um Fruth rock bridge. But a few other places we skip to go and visit the most stunning green valleys. Of course, we look out for Bedouin herding their sheep and goats. And hopefully, we also see camels with young roaming around in our desert. More information can be found on the tour page.